The credit card business is now the most lucrative part of the banking industry, and it's not just from the interest. It's the hidden fees. You pay off your credit card balance every month, thinking you are taking advantage of the "interest-free grace period" and getting free credit. You may even use your credit card when you could have used cash, just to get the free frequent flier or cash-back rewards. But those popular features are misleading. Even when the balance is paid on time every month, credit card use imposes a huge hidden cost on users--hidden because the cost is deducted from what the merchant receives, then passed on to you in the form of higher prices. Visa and MasterCard charge merchants about 2% of the value of every credit card transaction, and American Express charges even more. That may not sound like much. But consider that for balances that are paid off monthly (meaning most of them), the banks make 2% or more on a loan averaging only about 25 days (depending on when in the month the charge was made and when in the grace period it was paid). Two percent interest for 25 days works out to a 33.5% return annually (1.02^(365/25) -- 1), and that figure may be conservative . 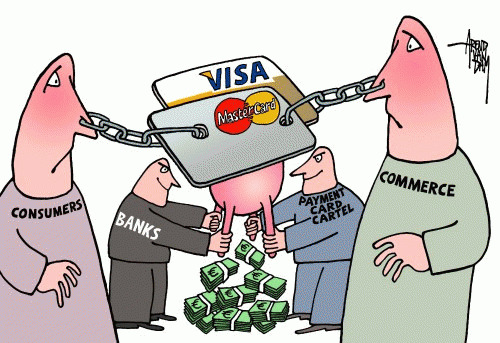 Merchant fees were originally designed as a way to avoid usury and Truth-in-Lending laws. 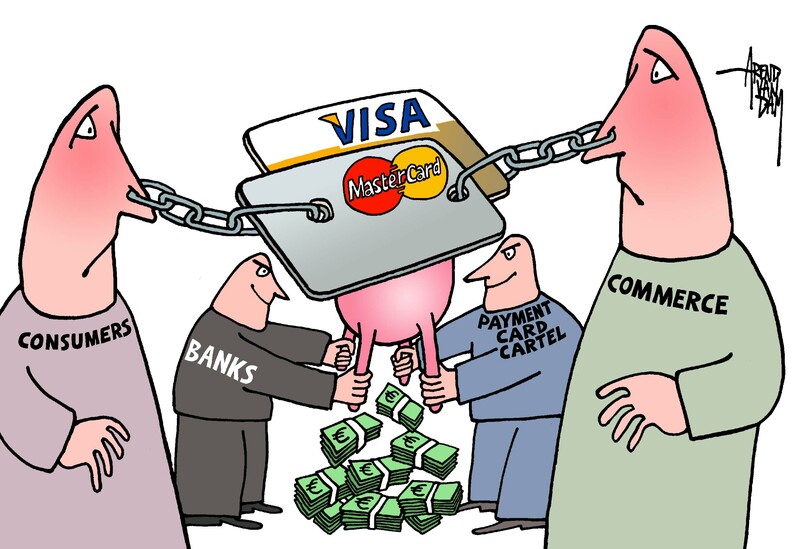 Visa and MasterCard are independent entities, but they were set up by big Wall Street banks, and the card-issuing banks get about 80% of the fees. The annual returns not only fall in the usurious category, but they are returns on other people's money -- usually the borrower's own money! Here is how it works . . . . Economist Hyman Minsky observed that anyone can create money; the trick is to get it accepted. The function of the credit card company is to turn your IOU, or promise to pay, into a "negotiable instrument" acceptable in the payment of debt. A negotiable instrument is anything that is signed and convertible into money or that can be used as money. Under Article 9 of the Uniform Commercial Code, when you sign the merchant's credit card charge receipt, you are creating a "negotiable instrument or other writing which evidences a right to the payment of money." This negotiable instrument is deposited electronically into the merchant's checking account, a special account required of all businesses that accept credit. The account goes up by the amount on the receipt, indicating that the merchant has been paid. The charge receipt is forwarded to an "acquiring settlement bank," which bundles your charges and sends them to your own bank. Your bank then sends you a statement and you pay the balance with a check, causing your transaction account to be debited at your bank. The net effect is that your charge receipt (a negotiable instrument) has become an "asset" against which credit has been advanced. The bank has simply monetized your IOU, turning it into money. The credit cycle is so short that this process can occur without the bank's own money even being involved . Debits and credits are just shuffled back and forth between accounts. Timothy Madden is a Canadian financial analyst who built software models of credit card accounts in the early 1990s. In personal correspondence, he estimates that payouts from the bank's own reserves are necessary only about 2% of the time; and the 2% merchant's fee is sufficient to cover these occasions. The "reserves" necessary to back the short-term advances are thus built into the payments themselves, without drawing from anywhere else. That is also why virtually all banks everywhere have to write-off 100% of credit/charge-card accounts in arrears for 180 days. The basic design of the system recognizes that, once set in motion, the system is entirely self-financing requiring zero equity investment by the operator . . . . The losses cannot be charged off against the operator's equity because they don't have any. In the early 1990's when I was building computer/software models of the credit/charge-card system, my spreadsheets kept "blowing up" because of "divide by zero" errors in my return-on-equity display.